The ordinance was passed to prohibit smoking in multi-unit housing, which includes community associations located in Culver City. With regard to community associations, this ban applies to all common areas and residential units, with the exception of designated smoking areas. We should note that for purposes of the ordinance, the term “unit” encompasses not only the dwelling area of a unit, but also any patio, balcony, or other outside area appurtenant to the dwelling unit where an owner might typically go to smoke. If you are on the board or manage a Culver City condominium association, you need to think about where to establish a designated smoking area at the association-preferably in a location as far away as possible from units so as to limit complaints from owners with units nearby. 3) a clause providing that it is a violation of the rules for a homeowner or any other person subject to the control of the homeowner or present by invitation or permission of the homeowner to violate any law regulating smoking while anywhere on the property. By November 26, 2015, condo association boards are required to give each homeowner written notice that all units will be designated as nonsmoking units as of May 26, 2016. So, whether they want it or not, every Culver City condominium association is or will soon be smoke free, and all smoking will be prohibited except in designated smoking areas. This includes the smoking of cigarettes, cigars, pipes, marijuana (even for medicinal purposes), hookah, or any other tobacco product or plant. While many of our clients have thought about amending their documents, Culver City has seemingly done that for all the condo associations located within its borders. And it has passed it off to the associations to enforce the new ordinance. It is understandable that condo association boards and managers would be concerned with this ordinance-who has to enforce it? The City? The association? Will there be liability for failure to enforce the smoking ban? According to ordinance, the City may enforce such things as signage, requirements for designated smoking areas, and the requirements of notice to homeowners, but will not enforce individual smoking violations within associations. In fact, one board member called to ask the City if they would be enforcing the ban, and the City advised that it did not have the manpower to do that. 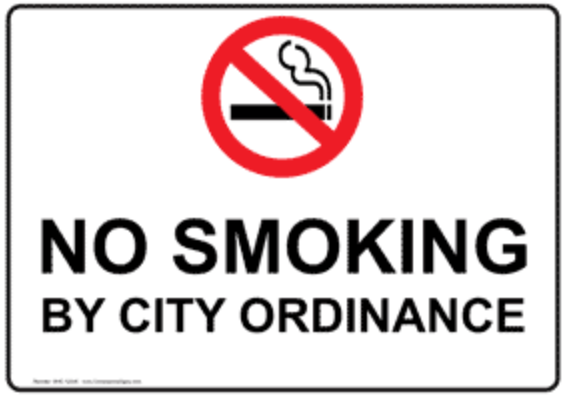 But, by requiring that condominium associations add the smoking ban to their rules, the City is making enforcement the associations’ responsibility. According to the ordinance, it is private individuals and organizations (i.e., condo associations) that will be responsible for enforcement of the ban. As we have reported previously, enforcement may not necessarily require a lawsuit. Associations must investigate any complaints of smoking, hold hearings, and consider facilitating mediation. If the resident will not stop the smoking, an association may, depending on the circumstances, be required to file a lawsuit against the smoker or be named in a lawsuit by the impacted unit owner(s). While it is appears that associations are not liable under the ordinance itself for enforcement of the ban, the requirement that associations amend their rules to include the smoking ban will have that very effect. Governing documents of associations often provide that the board has the duty to enforce the governing documents, and case law does say that boards have to take some action. So, if the governing documents now say that smoking is prohibited (and the rules are part of the governing documents) and a member complains to the board, the board would likely have to investigate any complaints of violations of the ban and levy fines for these violations. Such violations would likely also implicate the notice and hearing requirements for disciplinary action of owners. This is probably not what most boards or managers would like to hear, as they may now be responsible for policing smoking violations throughout the property, including within residents’ own homes, but it appears that is the case. Keep in mind, however, that there are varying degrees of enforcement. It may be best for associations that are dealing with these complaints to contact their legal counsel for advice on this issue. For more information on the ordinance, you can visit the city’s information page.